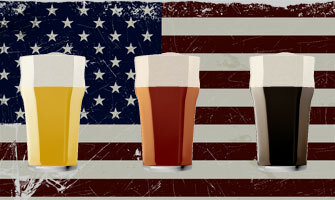 The United States of America — land of the free, home of the brave, and brewery capital of the world. That’s right: although China beats us in beer production by volume, America holds the title for most breweries in one country. What’s more, one source credits the US as having the most craft breweries of any country, fueled by the microbrewing explosion in the late 1970s. Our readers will find it pretty obvious that Americans love brewing and drinking beer (and why wouldn’t they?). But you might not know all the ins and outs of beer’s history here. The brewing industry has gone through a few booms and busts over the years, and we came pretty close to losing it all together. Let’s all be grateful that didn’t happen. Kick back, grab a cold one, and let us take you on a little trip through the annals of beer history. Before European settlers ever arrived in the Western Hemisphere, Native Americans were already brewing beer using corn. Early colonists in Virginia also made corn beer, probably with instruction from native peoples. Dutch explorers Adrian Brock and Hans Christiansen open the first brewery in the New World, located on the southern tip of New Amsterdam (modern-day Manhattan). This is the beginning of something great. The modern era of American beer begins 200 years later, though production and consumption is relatively low. There are 132 breweries in operation, and per capita consumption of commercially-brewed beer is less than one gallon each year. We can hardly imagine. Many German citizens begin emigrating to America to escape widespread revolutions and war with Denmark. They bring with them a preference for all-malt lagers. At the time, many Americans still prefer lighter beers that include corn or rice in the recipe. German brewers will have an important role in changing that preference over the coming decades. There are 4,131 breweries operating in America, an increase of over 3,000% since 1810. This is due to many factors, including continued immigration from beer-drinking countries, industrialization, urbanization, rising wages and technological advancements. German-style lagers outpace British ales to become the most popular beer in America. It’s a great time to be a beer nut. Over the last century, per capita beer consumption has risen to 20 gallons each year. However, consolidation in the brewing industry has eliminated the great majority of independent brewers and given rise to corporate giants like Anheuser-Busch, Pabst Brewing Company, and Miller Brewing Company. Only around 1,000 breweries remain in operation. It’s a dark time for American beer drinkers. As a result of the Temperance Movement, the 18th amendment goes into effect and national Prohibition begins. Production and distribution of beverages containing more than 0.5% alcohol by weight becomes illegal. The drinking public has to take a risk with bootleg liquor or make do with poor-tasting “near beer.” We don’t envy those who lived through this period. On April 7, the first rays of hope emerge from behind the clouds of sobriety. Congress passes the Cullen-Harrison Act, which re-legalizes beer and wine with up to 3.2% alcohol by weight. Adults around the country celebrate with their first legal beer in 13 years, and the date is later commemorated as National Beer Day. In December, the 21st amendment repeals the 18th amendment and officially ends Prohibition. We’d like to take a moment to thank the politicians who made this happen. The American Can Company cans beer for the first time. Until this point, the vast majority of beer was purchased on-tap in bars or in bottles, which was much more expensive than draft beer. Canned beer was cheaper and easier to transport and changed the industry, allowing large companies to expand rapidly. Although 756 breweries were operating within a year of Prohibition’s end, there are now only 407. In 11 years, that number will decrease to 230. American beer lovers managed to defeat Prohibition, but they are once again headed in a bad direction as giants like Anheuser-Busch, Pabst and Valentin Blatz Brewing squeeze out smaller brewers. Big business is getting in the way of great beer. Frederick “Fritz” Maytag III purchases the failing Anchor Brewing Company in San Fransisco and turns it around into a profitable business. Many modern brewers consider this a turning point in American beer and the beginning of craft beer revival. Jack McAuliffe founds the New Albion Brewing Company in Sonoma, California. This is considered the first modern craft beer brewery and serves as a blueprint for contemporary and future microbrewers. With the efforts of Maytag, McAuliffe and others, American brewers have begun the long journey back toward unique varieties of locally-made beer. We salute them. Congress passes the bill H.R. 1337 and President Jimmy Carter signs it into effect, making homebrewing of beer and wine legal for any adult. Even after Prohibition ended, it was still illegal for individual citizens to brew beverages with more than 0.5% alcohol. 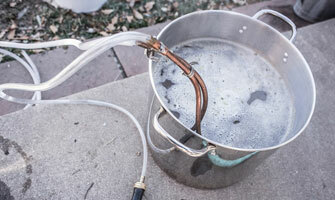 This bill begins the homebrewing revolution that will forever change the face of American beer. This is the lowest point in American brewing since Prohibition. A total of 80 breweries are operating, run by only 51 companies. The vast majority of commercial beers are similar in style: pale, light lagers with low hop content and a bland flavor. Beer lovers and aspiring brewers around the country must be as outraged as we are just thinking about it, because this will change within a few decades. At the beginning of the new millennium, there are officially more breweries operating in the US than in any other country. Over 1,500 American breweries are in operation, with the number rising every year. By 2013, this number has nearly doubled. The American brewing industry hits a remarkable achievement. In November, there are 4,144 breweries operating around the country, just surpassing the record number from 1873. Small, independent and craft breweries account for 99% of this total. We have come full-circle, with creative local brewers once again leading the evolution of American beer. Today is a great time to be alive for everyone who loves to make and drink beer.